I know it has been some time since my last post, but things have been a bit hectic. I figured that since I have finally started to feel halfway normal, that I would post these pizza bombs. These things are awesome, and can be eaten as a game day snack, or taken down as a meal, much like pizza. Another great thing is that you can make them anyway you like your own pizza. I made these as a game day snack, and I wish I would have made another batch as they only last a brief moment. Start by rolling out your pizza dough on a lightly floured surface. You probably want to roll this about 1/4 inch thick. Next, preheat your oven to 425 degrees. Butter the inside of a casserole dish. Now, take a pizza cutter, and slice the dough width wise, in half, and then cut into about 1 1/2 inch slices. Pour the pizza sauce into the bottom of your buttered casserole dish. 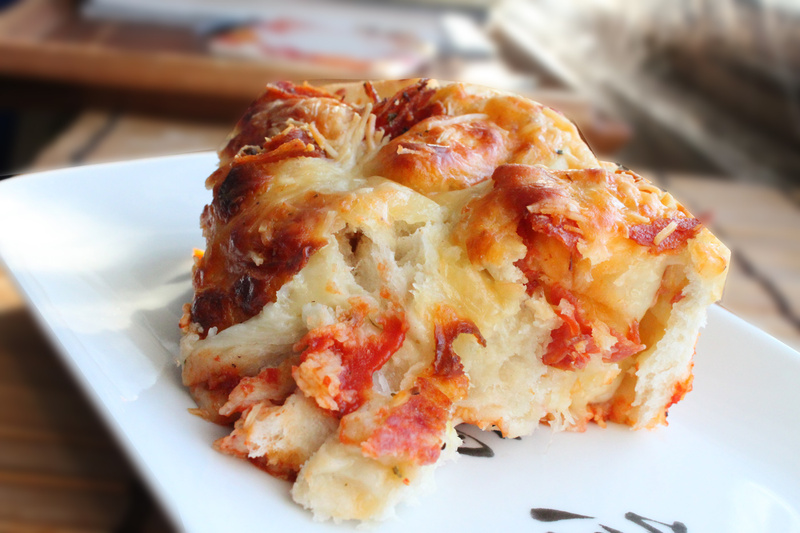 Take one of the bags of cheese and pour it over the pizza strips, to cover. Next take the sliced pepperoni and add this to the top of the cheese. Now the fun part. Roll each slice into pinwheels, and place vertically, allowing it to stand up into the casserole dish. Repeat with all remaining pizza strips. Top with the remaining bag of cheese, and any additional pepperoni. 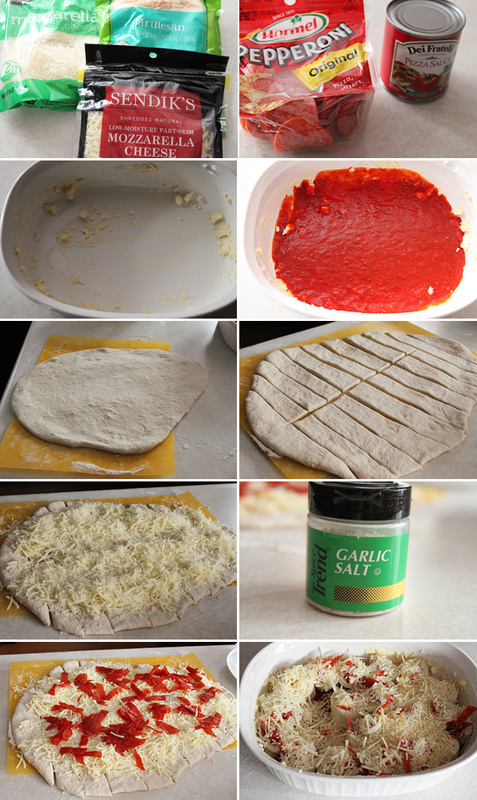 Sprinkle with some garlic salt, and then bake uncovered in the oven for about 18 minutes or until the dough is cooked, and the cheese is nicely melted. Remove from the oven, let cool for about 5-10 minutes, then dig in. These things were everything awesome about any type of pizza. I hope you enjoy!